Step, breathe, breathe. Step, breathe, breathe. Silhouetted against a clear dawn sky a fragile filament of climbers slowly makes its way up a steep icy slope. Their lungs strain in the crisp morning air. Strange, surreal shapes surround them – crystal icicles, billowing snow fields, jagged blocks of ice, precariously balanced. Far below, a pillowy blanket of clouds spreads to the horizon. Above, an endless expanse of snow reaches skyward. Like ants, the rope team inches upwards. Step, breathe, breathe. Step, breathe, breathe. And then, at last, the top! 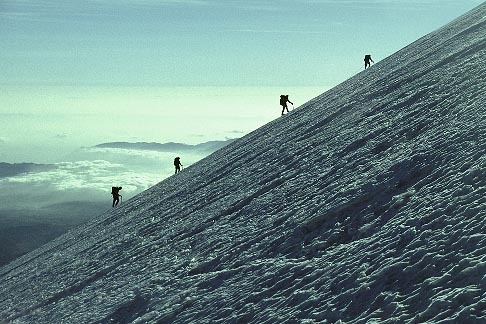 Breathless, the climbers reach the flat summit plateau one by one and rest. Water, food, warm clothes, a few photographs. Exhilaration. The effort, the struggle have paid off. Standing atop the highest peak of Mexico, 18490 ft (5636 m) Pico de Orizaba , they gaze upon a stark scene of utter beauty and stillness. For a moment they glimpse the realm of the gods. Then they must return. “The object of mountaineering is to reach the bottom safely,” goes an old saying. Carefully descending, foot upon foot, they retreat from the heights.